Instructions for logging into our library resources off campus. Problems with Your Coast Username or Password? If you are a currently enrolled student and are not able to log in, locked out, or have other questions about your COAST Username or Password, they can help. Self-service: Use the "Forgot Password" feature on this page to reset your password. NOTE: Your ONE-TIME passcode will be emailed to the personal alternate email that you must have set up in MyGWC. Call District IT if you do not recognize the alternate email or need to set one up. Step-by-step instructions with screenshots showing how to reset your Coast Password. *Tip: Once reset, you can set up your phone to recover your password in the future! Scroll down to the bottom for more information. When you click on a library database, you will be asked to login to get into the database or retrieve the full-text of the item you are viewing. 1. 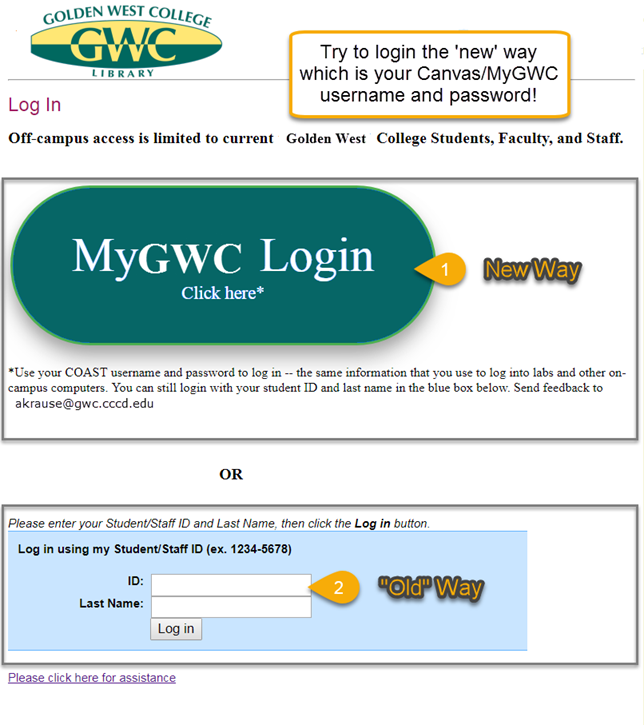 The 'new' way to login is to click on the big green button that says "MyGWC Login Click here*". 2. Instructions for logging in the "Old" Way.